If you’re a parent, you’ll likely have lived through the terrifying experience of the modern day naming ritual. Choosing a name for another person – something they’ll have to live with for the rest of their life – is a massive responsibility. 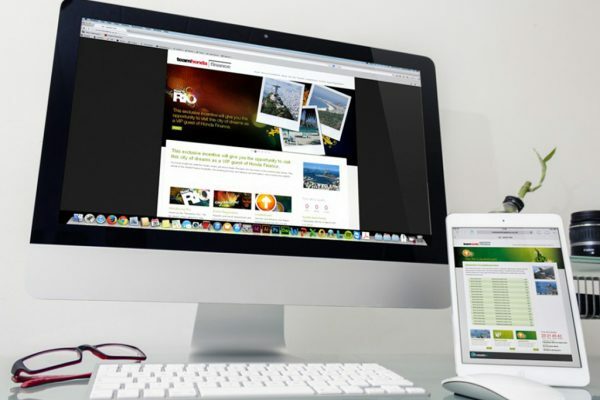 Likewise, your brand name, and indeed your live event identity, creates an important first impression. 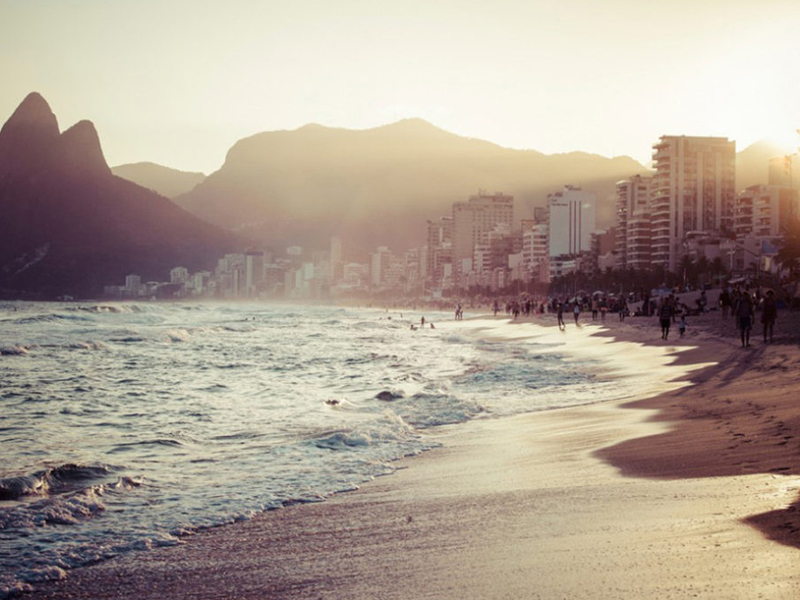 It’s your first touch point with your audience and its tone is crucial. We don’t want to get into quoting Shakespeare here, but the guy raised a fairly important point. Would a rose smell as sweet if it were called another name? We’re guessing yes but we get the sentiment. It resonates further when you consider the naming of brands. Would Apple’s global success be what it is today if the company were named, Banana, do you think? The live events arena is a seriously competitive space. 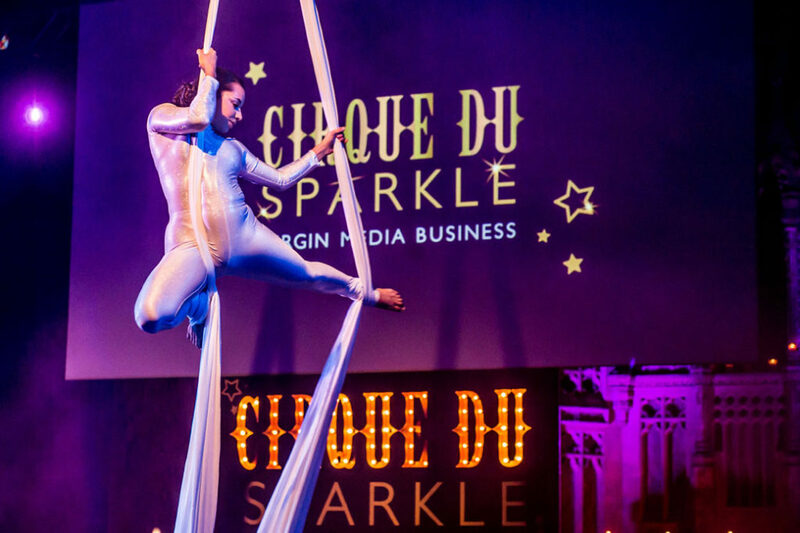 Marketing insight company Pearlfinders reported in January that a growing number of brands are looking to increase their use of experiential and events channels this year – a 54% lift on 2014. And, as we reported in our Experiential vs Exposure article recently (read more here), event marketing is now outpacing all other forms of marketing. 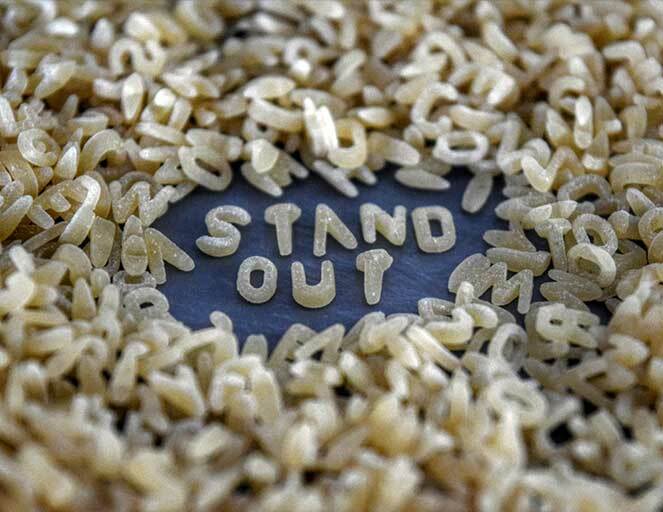 Whilst that’s great news for the industry, it also presents a significant challenge: how do you stand out from the crowd and create an impact amongst all this noise? One of the main USPs of live events versus other forms of marketing is their ability to engage in a meaningful way, creating an emotive, tangible and real connection with a brand’s audience and that starts at the beginning, with the event’s identity. 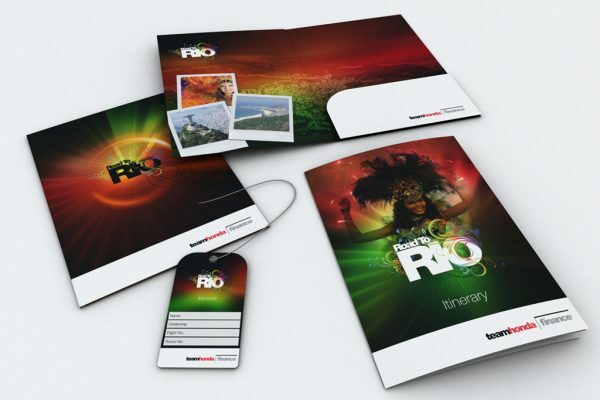 Creating a unique event brand can help to set the tone and build excitement and engagement around your event, as well as making a valuable association with the parent brand/company. The most successful brands are those that have a distinct and engaging multidimensional personality; those that resonate and create a real connection, whether in the B2B or B2C spheres. And the same can be said for events. A distinct identity helps to set expectations before the event, giving people a taste of what they can expect whilst enhancing your brand’s communications on and offline. A catchy and well thought-out event name can also help emphasise your key messages and create a hook for designing content sessions, break-outs, printed materials, social activities and catering. Your theme can be weaved through every element of the delegate journey, playing on multiple senses – ensuring delegates remember the sight, sound, feel – even the taste and smell of your event. That’s one way to maximise message recall! This is more than just theory, next we look at a couple of examples where we have created event brands and identities to enhance message delivery for our clients. When Virgin Media merged three departments into a new division called ‘Growth’, they wanted to bring these people together to explain their importance as one team to the business, and how they were so much better together. 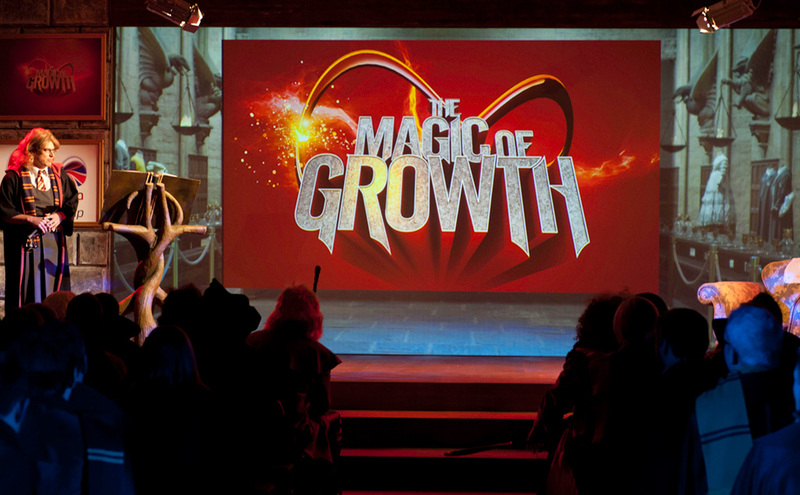 Clive was tasked with creating an immersive event for Virgin Media Growth employees. A conference was not going to cut the mustard here. The event needed to be engaging and entertaining – something that would ignite the imagination and leave the team feeling inspired and positive about the future and their place within the company. 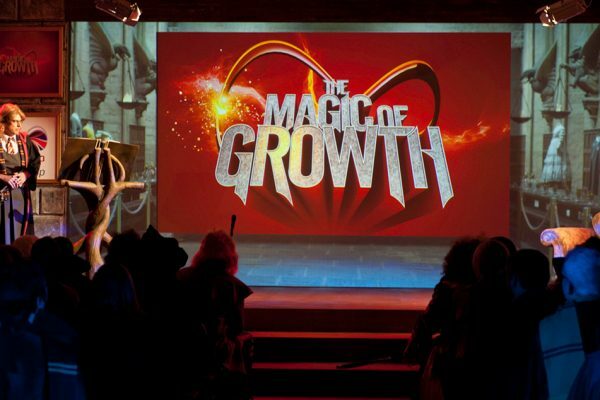 We created a bespoke ‘Magic of Growth’ event brand, with a large-scale event for Virgin Media Growth employees. 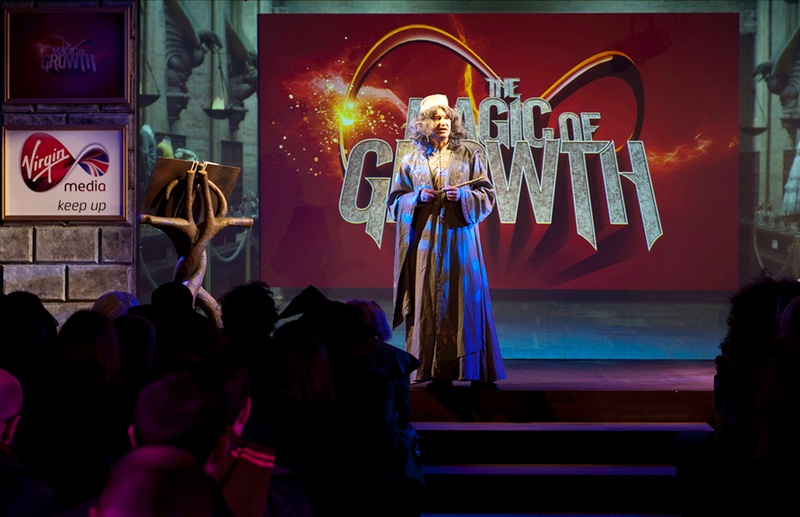 With a flick of our magic wand, we transported guests to Hogwarts School of Witchcraft & Wizardry (aka The Grove, Hertfordshire), which had been transformed with original set pieces, dramatic theatre style lighting, breath-taking production and some incredible special effects. 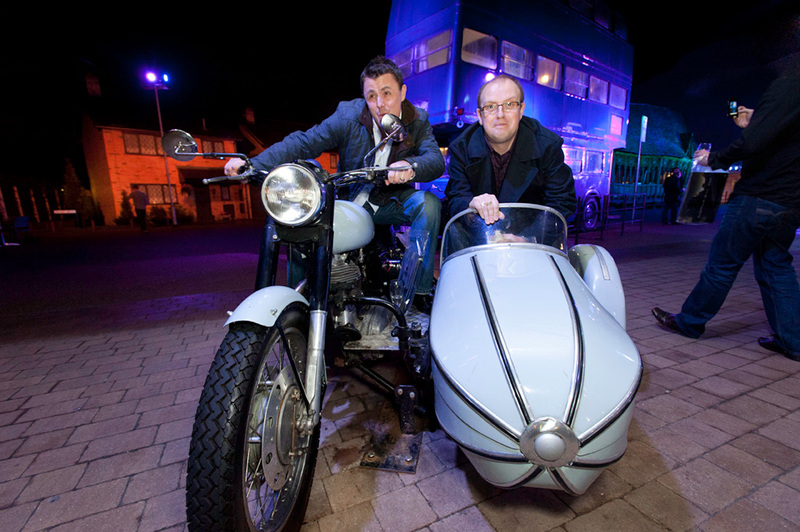 The magic theme was carried through the whole event from branding right through to entertainment and catering. Content delivery came in many forms on the day, from beautifully produced story led video and live storytelling, to on-stage illusionists and magic battles. 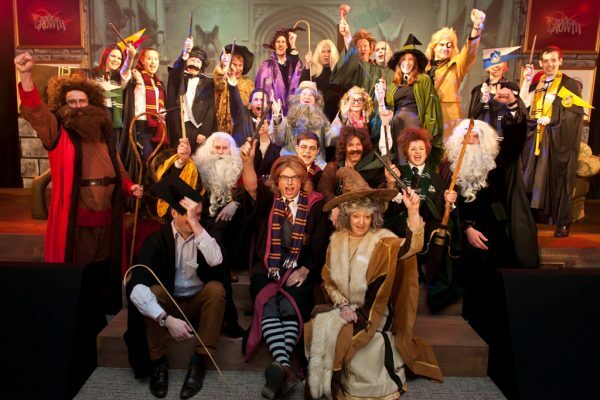 We continued the theme through to the menus, with guests dining on witches broth, chocolate frogs and witches hat cupcakes, before they were permitted a visit to the Honeydukes sweet shop. And then it was off to the Harry Potter Experience for the first ever exclusive evening, where guests enjoyed an after party like no other, complete with broomstick battles and Death Eaters on the guest list! Feedback from the event showed that 95% of guests agreed they had a better understanding for the priorities of the business; 92% agreed they had a better understanding of the go-to-market, customer & product strategies and crucially, 97% agreed that the event made them proud to work for the business. Clive worked with Honda Finance Europe to develop an engaging incentive programme to drive sales within its consumer finance division. 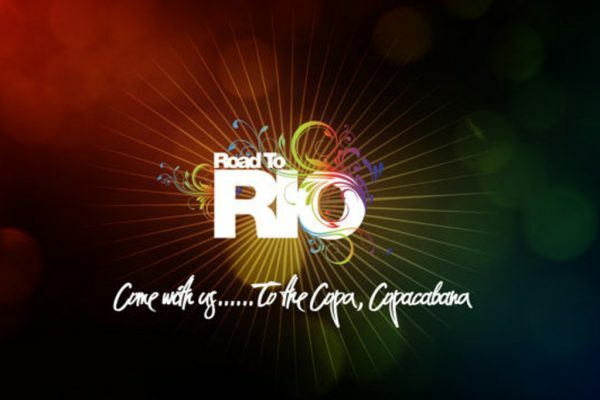 Road to Rio was born. Presented with the task of incentivising and motivating over 150 automotive dealers to achieve and exceed substantial targets, we knew we needed something special. Our answer was an engaging incentive programme, ending in an exhilarating trip which offered much more than a simple holiday experience. Incentive schemes are two a penny in today’s corporate word. If you’re going to create meaningful engagement with employees or partners, you need a little imagination. 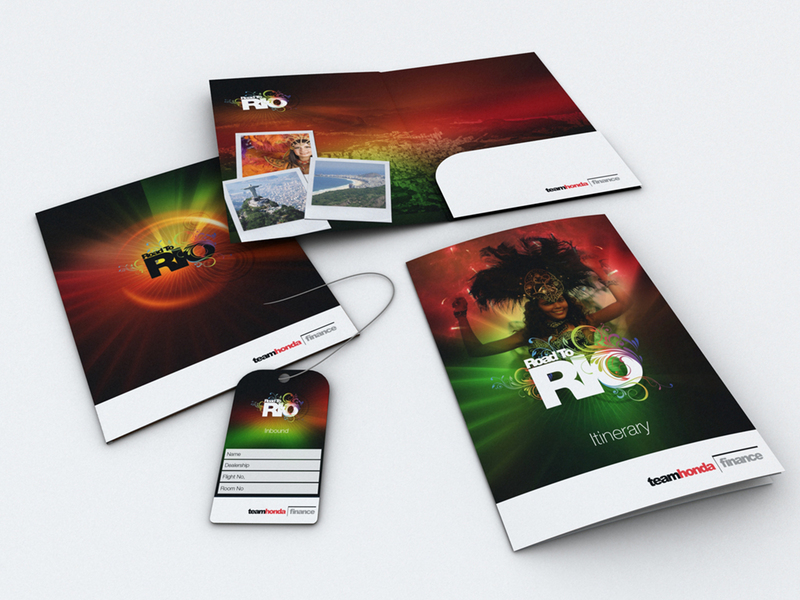 After designing a vibrant and eye-catching event brand, we started our communication campaign. 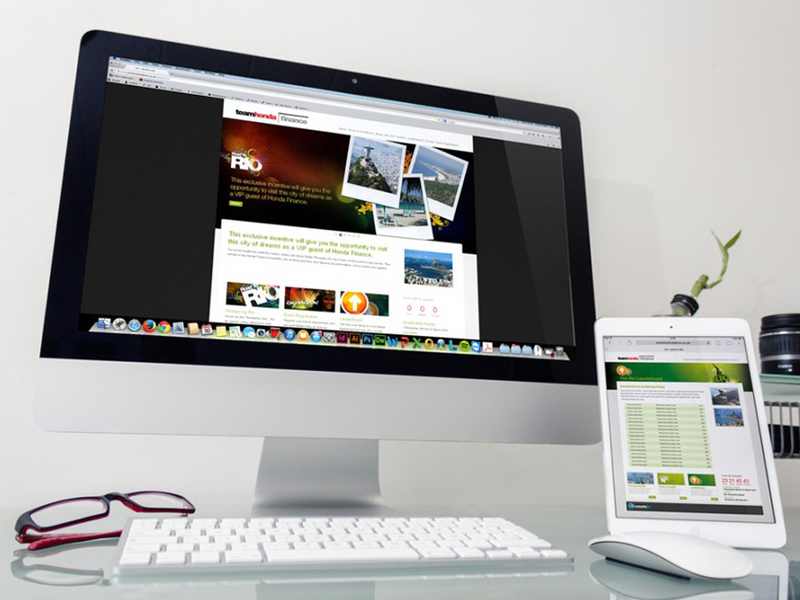 First we introduced the points system and online portal, which was supported by monthly branded communications with all partners reminding them of the upcoming trip and the progress they needed to make. At the end of this year-long incentive programme, which saw a huge uplift in sales and 40 top dealers smashing their targets, we delivered an incredible reward fit for a king. 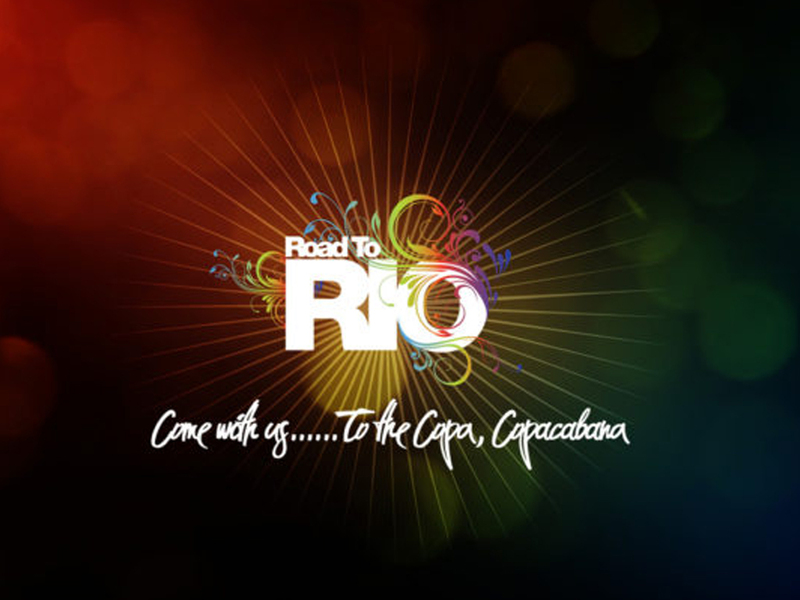 Click here to find more about the Road to Rio incentive trip.